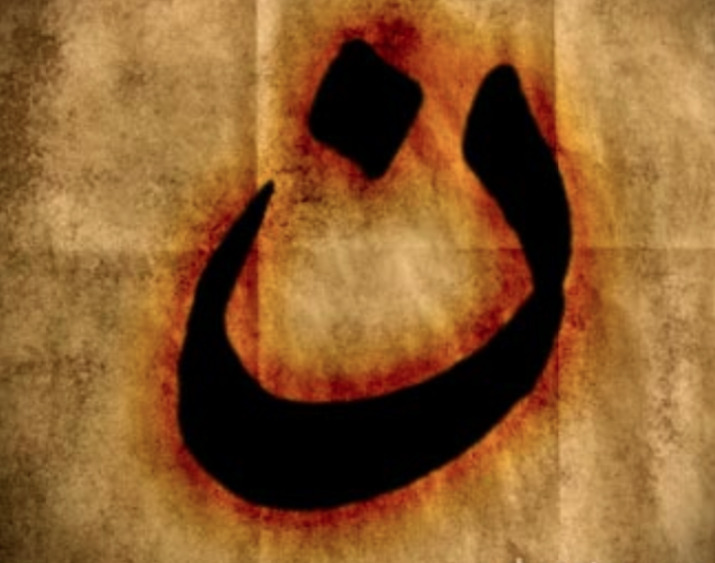 Nuun (ن) is the first letter of Arabic the word Nasara (نصارى or Nazarene). Since the beginning of the Islamic invasion of the Christian world in the 7th century this letter has been used by Muslims as a pejorative, a mark of shame, a scandalon Today in Syria and Iraq, a new generation of invaders use it to stigmatize and persecute the few remaining Christians in the region. In the same way the Nazi's used the Star of David to identify Jews for persecution and eventually extermination, these Muslim terrorists use nun for their new Ji'hadi Holocaust. Therefore, many Western Christians now display nuun as a mark of Gospel hope and a demonstration of solidarity with our persecuted brothers and sisters in the lands where the Church of Jesus Christ was born. We gladly bear the scandal of the cross. And so, with this sign we joyously declare that together with the faithful all around the world, we belong to the Resurrected Nazarene, the Savior of the World, God Almighty, the King of kings, and the Lord of lords. And one day, we know that "every knee shall bow and every tongue confess that Jesus Christ is Lord."